We actually did it! 18 months (and more) in the making and the kitchen is well and truly ticked off the list! Albeit with a few finishing bits here and there, but who's counting those really? We spent NYE 2016 plastering and by the end of January we had actual kitchen units on order. Although it wasn't until the end of summer that we had all the worktops in place (major budget issues!) and the DIY kitchen fitting was complete. Buttttt we got there eventually and we now have a kitchen! It looks so bloody different from where we were last year, it's actually unreal. The dining room has also been finished, HURRAH! 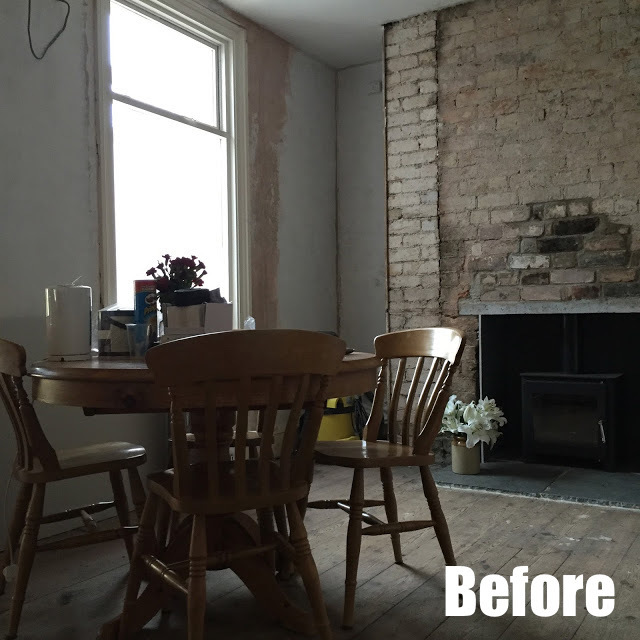 Earlier this year we repaired the rotten joists, sanded floorboards, did yet more plastering, built a log stack, painted and finally it began looking like an actual room. We now have somewhere to sit, eat, and be warm. What joy! We'll be updating the table in the future, but it's looking so much better this year. I was really lucky this year to be sent over a box of Karndean Loose Lay flooring to try out, so it was the perfect time and place, to do a little inner hallway porch update. We fitted the new floor (which I totally love!) and painted over the old ugly wallpaper. I even gave the door a little new paint job too (although I'll be writing about that one soon). It's definitely not 'renovated' but it's looking a bit better that's for sure! The conservatory wasn't on the original 'to do' list, but with windows from the kitchen looking into it - it was a room that was basically an ugly room that was kinda ruining the nicely finished kitchen. We cleared it out completely and began looking to do a budget makeover - starting with the floor. And what's more budget than paint? I created a whole DIY patterned floor, which I'm over-the-moon with and I think looks pretty darn good too! So that's basically it for 2017! We didn't get that much done in the way of numbers, but finishing the kitchen was a pretty big job and definitely one I'm glad to see the back of too! We have way more planned for 2018 and I'll be sharing all that very soon, so watch this space. What's your biggest home achievement of 2017? Wow beautiful house renovation! Thank you so much for sharing, this gave me so many great ideas.